On 6th November a unique local spectacle takes place, the London to Brighton Veteran Car Run. Organised by the Royal Automobile Club (RAC) and Bonhams, this is the world’s longest-running motoring event, attracting participants and spectators from around the globe. The original Emancipation Run of 14th November 1896 celebrated the passing of the Locomotives on the Highway Act (or ‘Red Flag Act’) that raised the official road speed limit for ‘light locomotives’ from 4mph to 14mph and abolished the requirement for a man on foot to precede these vehicles. The event was first formally re-enacted in 1927 and has been commemorated every subsequent November, except during WW2 and in 1947, when petrol was rationed. This year marks the 120th anniversary of the original 1896 Emancipation Run. The Run follows the traditional 60-mile route from Hyde Park to our home city of Brighton and this year around 400 British and foreign motor cars built before 1st January 1905 will commence the journey. The organisers emphasise that it is ‘not a race, but an endurance test of man and machine’ – an opportunity to ‘showcase the pioneering spirit and engineering ability of the early motorist.’ Traditionally thousands of spectators line the route through Surrey and Sussex, cheering on the valiant vehicles and their occupants who, embracing the historic spirit of the occasion, bundle up against the autumnal weather in rugs and vintage-style motoring gear. Following the advent of the automobile in the 1890s, motoring grew fashionable among the wealthy of Edwardian Britain. Early motor cars, without windscreen or windows, were open to the elements and, additionally, early motorists sat on the car, fully exposed to public view. Consequently motoring not only demanded new kinds of protective outerwear, but also created another social occasion for sartorial display. Novel lines of purpose-designed clothing and accessories rapidly evolved, from car rugs and overcoats to boots and gauntlets. Some were more practical than alluring, but from the outset motoring expressed affluence and privilege, linking driving with glamour and style - an image used to promote diverse products from tyres to oil and still promoted in car advertisements today. Driving in open cars in all weathers required heavy-duty protective clothing and provision of early motoring gear was chiefly associated with long-established manufacturers of quality outerwear, Aquascutum and Burberry’s, both pioneers of stout, water-resistant fabrics. Also influential was Alfred Dunhill, who in 1893 launched ‘Dunhill’s Motorities’, supplying leather overcoats, goggles, time pieces and other accessories, while department stores like Gamages began to stock everything for the motorist. Early drivers and passengers had to dress according to the weather and motoring coats were made in various materials. 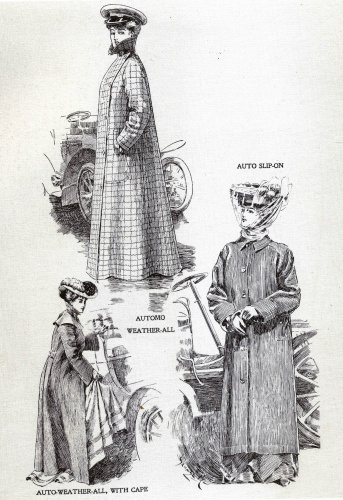 Long, loose-fitting waterproofed motoring coats were essential, Burberrys’ ‘Viator’ and ‘Rusitor’ both popular Edwardian styles, while tweed and Irish frieze were some of the warmest woollen coats. Many male motorists favoured a caped Ulster overcoat, perhaps lined with squirrel fur, or beaver or musquash. Fur coats, already luxury status symbols, were a favourite and motoring also encouraged the adoption of other, previously-unfashionable animal skins. A new range of men’s fur coats, shaggy and consciously primitive-looking, included goat, bear, wolf, jackal and racoon, these bulky, rugged garments remaining popular for driving open-topped sports cars even when closed automobiles became more commonplace during the 1920s. Ladies’ fur motoring coats were designed for comfort and style: for example, carefully-matched grey squirrel skin coats might have deep contrasting collars and cuffs of fashionable opossum or fluffy white fox fur. Moleskin and glossy Russian pony skin coats were much admired, as were smart costumes of warm, lightweight Danish kid comprising a hip-length jacket and matching ankle-length skirt. Leather motoring gear was already, by the early-1900s, favoured by drivers aiming to cut a dash at the wheel, beginning the long association between leather and motor sports. In the early-1900s many roads were unpaved, especially in rural areas, and in dry weather clouds of dust hampered vision and breathing and covered motorists’ clothes. Summer motorists often wore a loose-fitting lightweight dust or duster coat of unlined canvas, linen, flannel or alpaca, usually coloured off-white, grey or beige and sleeves featuring elasticated or strapped inner cuffs. Protective headgear ranged from peaked driving caps and conventional cloth caps to deerstalkers and other hats with ear flaps. Some women adopted peaked caps, although a hat and veil became more usual, to screen hair and face from dust and oil smuts and protect the complexion. Adjustable gauze veils, worn up or drawn down over the face, were layered over a fashionable wide-brimmed hat and tied under the chin, an extra veil of rubber tissue kept handy, for use in sudden rain. More functional but bizarre-looking headwear that preserved a good hat or ornate hairstyle included wire-framed hoods covered with substantial veiling and incorporating a window of mica at eye level. Driving on un-made roads without a windscreen also exposed motorists to flying debris like loose stones and horseshoe nails, and insects. To shield the eyes, male drivers generally used goggles, common types including convex eye-glasses with nickel or aluminium rims and an elastic strap worn around the head or a one-piece mica mask or eye-shield. Dedicated motoring goggles set into a close-fitting leather mask afforded the best protection and in winter these also shielded the eyes from cold air, which, along with other irritants, could cause serious eye infections. Although most women preferred a veil, some used goggles, especially serious female motorists who drove at speed. Other accessories for the early motorist included warm fur car rugs and waterproof tarpaulin-like ‘aprons’ for winter; also goats’ hair or fur-lined leather foot muffs and foot protectors, some foot muffs made all-in-one with fur lap robes that wrapped around the body. Ladies could adapt their costume for different motoring occasions and might, for instance, wear a suede ‘motor calling wrap’ for social calls by motor car, or for evening engagements a soft Danish kid ‘motor theatre coat’ in orchid mauve, peach blossom pink or canary yellow with storm collar and cuffs of chinchilla fur. Protective driving gloves or gauntlets with long stiffened cuffs were both practical and fashionable, some ladies owning leather gauntlets in various colours to complement different motoring coats and fur popular for winter driving gloves. Dorothy Levitt (1882/3-1922), pioneering motorist and reportedly the first British woman to win a motor race, held firm opinions about female motoring dress and accessories. In her manual for lady drivers, The Woman and the Car (1909), she advised against wearing woollen gloves, favouring good soft kid. Her suggestion that gloves and other personal items like handkerchief and veil could be kept ‘in the little drawer under the seat of the car’ probably inspired the familiar ‘glove compartment.’ Another tip was to keep handy a vanity mirror, not simply for beauty purposes, but to serve as a rear view driving mirror, before cars were built with these attachments. Her recommendations reflected the dual considerations of early motoring gear: practical demands and presenting a fine figure at the wheel.